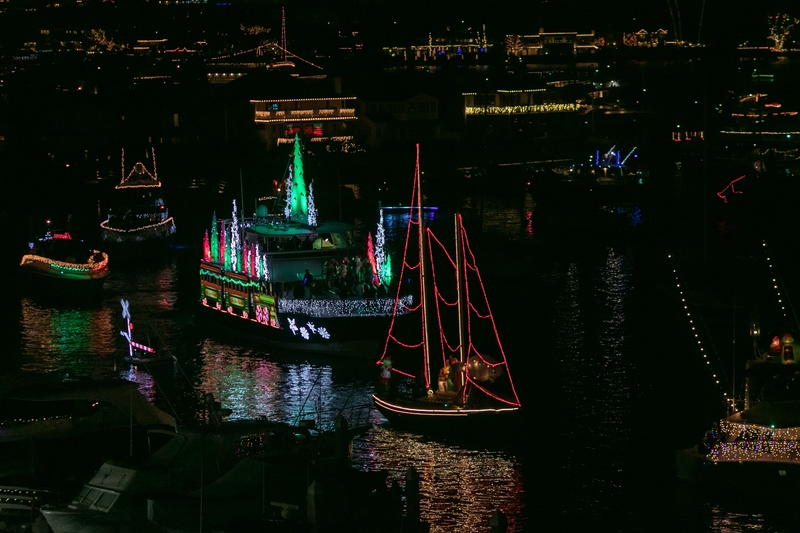 The 109th Newport Beach Christmas Boat Parade sailed into its first of five nights on Wednesday. 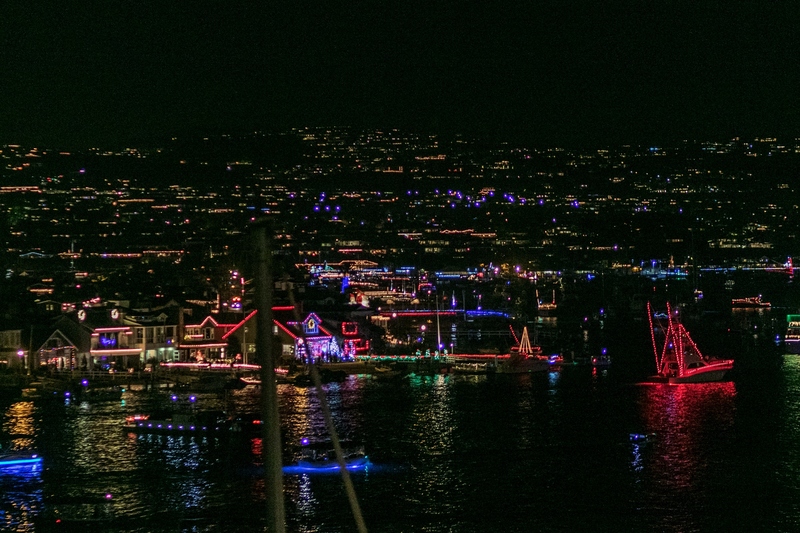 The 109th Newport Beach Christmas Boat Parade sailed into its first of five nights on Wednesday in spectacular Southern California fashion. 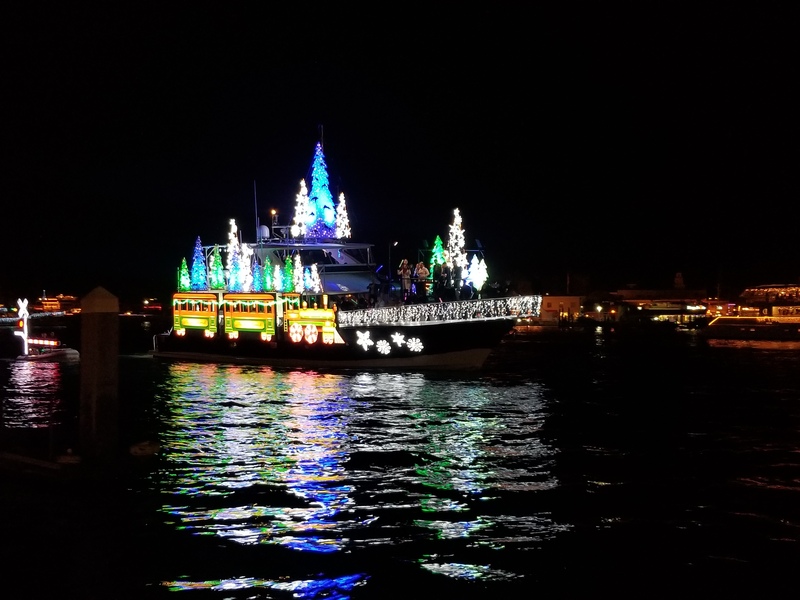 After a golden sunset gave way to a pleasant December evening of calm water and wind, fireworks that would rival Disneyland’s best announced that the parade had officially begun. Inside the Balboa Bay Resort, Hollywood itself could not have cast a better OC-themed evening. 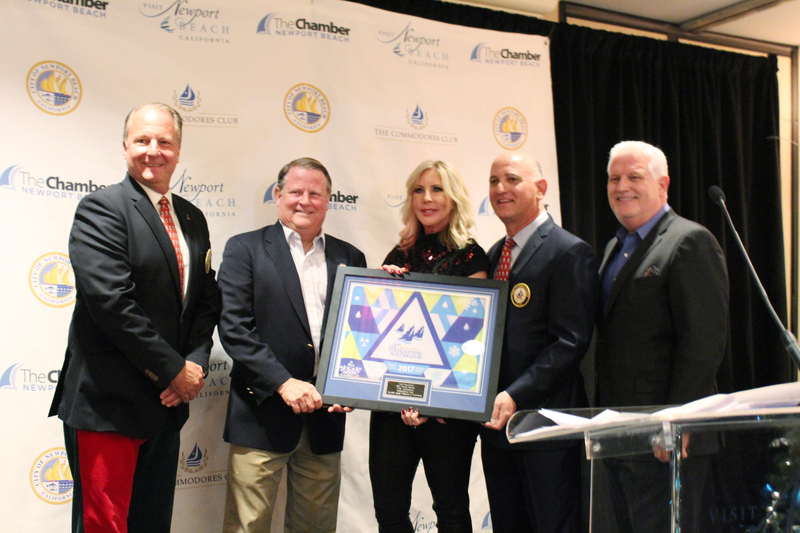 Lifelong Newport Beach resident and now mayor, Marshall “Duffy” Duffield, declared Vicki Gunvalson, one of the original Real Housewives of Orange County on the Bravo reality TV show of the same name, to be Grand Marshal of the first night of the parade. 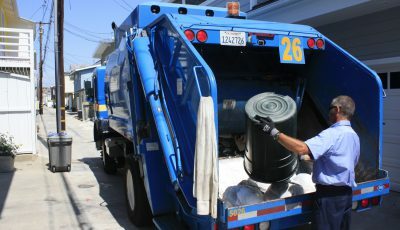 Gunvalson does not live in Newport Beach, but her TV show often films in the area. Gary Sherwin, President and CEO of Newport Beach and Company, said selecting her as a Grand Marshal was an easy choice. 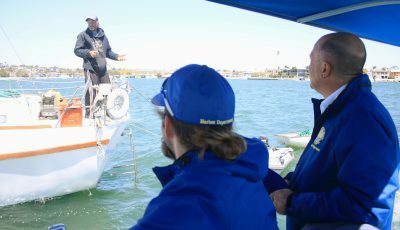 The reality TV show promotes the “aspirational” lifestyle of Newport Beach, he said. 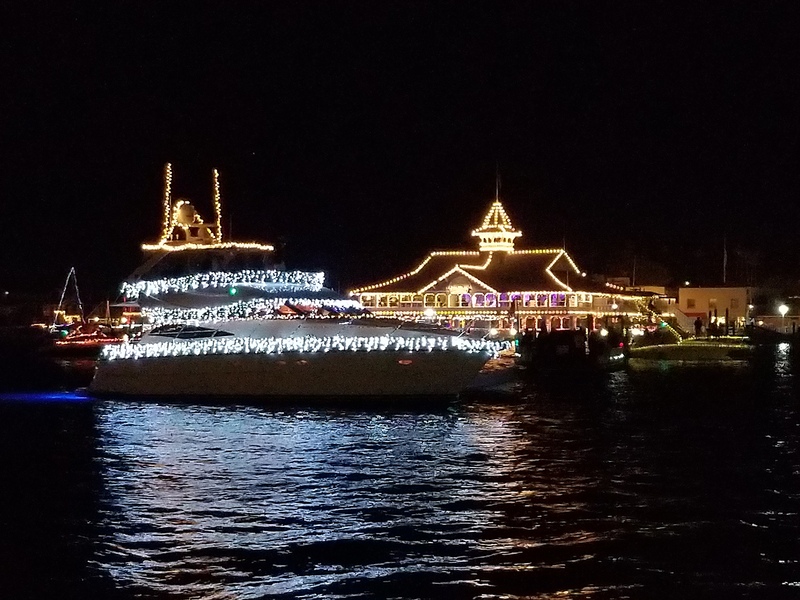 Vicki Gunvalson of Bravo’s Real Housewives of Orange County is declared Grand Marshal of the first evening of the annual boat parade. In real life, Gunvalson is gracious and warm, despite what many may presume. She also subtly dismissed her image on the notoriously dramatic reality show. “Don’t believe everything you see on that darned TV show,” she said. Gunvalson thanked the city and parade sponsors as she was officially declared to be Grand Marshal by Duffield. 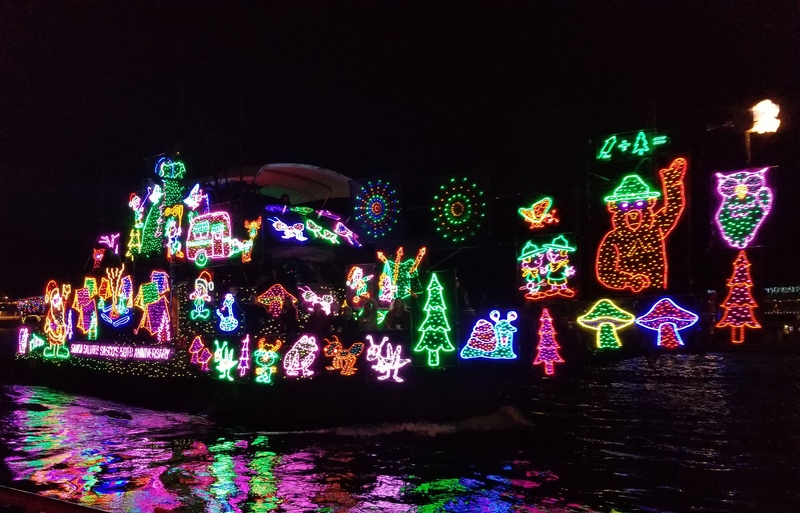 She told the audience that while she has seen the boat parade in the past, Wednesday would be her first time experiencing it from a boat. The mother of two and grandmother of two became emotional at the end of her speech, saying that she had wished her kids were there. 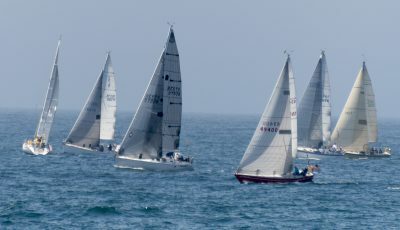 She, along with her boyfriend Steve Lodge, his family, and other distinguished guests sailed off from the Balboa Bay Resort to start the parade. For the first time in around 30 years, the parade route began at the tip of Lido Isle. David Beek, who serves as one of the parade’s co-chairs, said the new starting point was for safety reasons, as well as to give the western side of Lido Isle and the eastern side of the Balboa Peninsula the benefit of the beginning part of the parade. Those who host viewing parties at their homes will probably note that the parade passes their home at a different time this year. It may be 25 minutes later than usual, he said. From left to right: Councilman Brad Avery, his wife Julie, Mayor Duffield, and Mayor Pro Tem Will O’Neill. The new starting point also provides more of a continuous parade view to the hundreds who will watch from Marina Park this year. 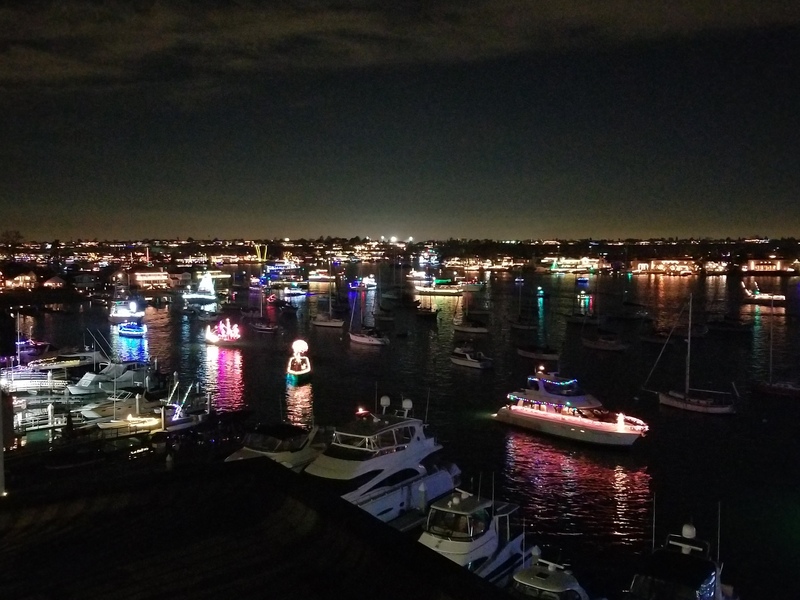 Beek called Marina Park the “epicenter” of the boat parade. 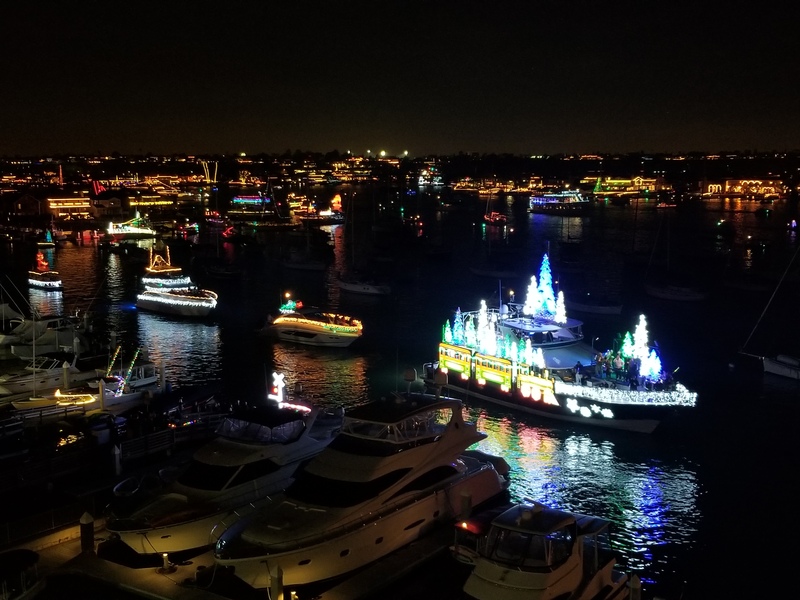 Marina Park hosted opening night activities as well, including festive food and beverage vendors, caricature artists, face painting, and appearances by Rudolph the Red-Nosed Reindeer and Frosty the Snowman. The LA Charger Cheerleaders, who also serve a Grand Marshals of Saturday’s parade, appeared on Wednesday night. City leader leaders past and present were in attendance, including Councilman Brad Avery. “I’m impressed that the Chamber of Commerce was able to get such perfect weather,” Avery joked about the balmy conditions. Will O’Neill, who was elected as the city’s new mayor pro tem on Tuesday, was also on hand for opening night. 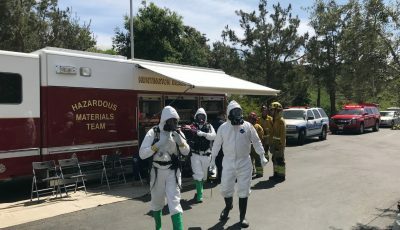 Chamber of Commerce President Steve Rosansky echoed the sentiment when he addressed the crowd. “From its humble beginnings, the parade has been by, and for, the community,” Rosansky said after thanking the city and its leadership. 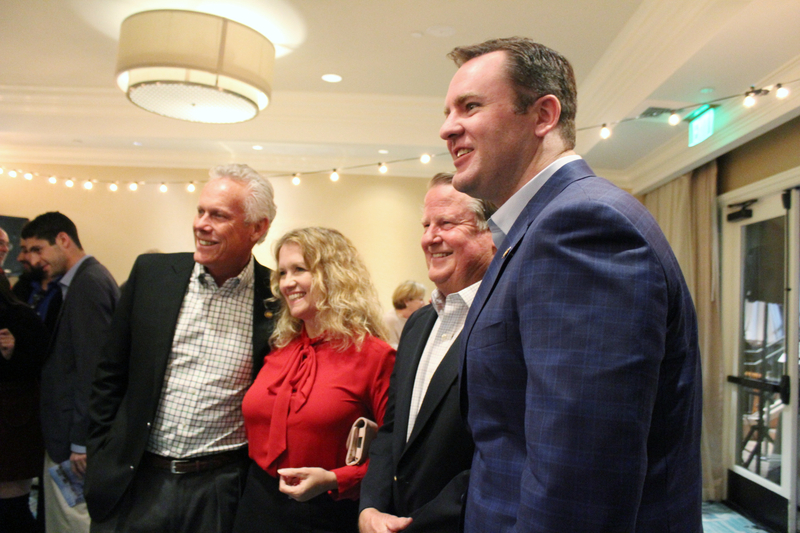 New Mayor Marshall “Duffy” Duffield addressed the audience on Wednesday night at the Balboa Bay Resort as Parade Co-Chair David Beek and Chamber of Commerce President Steve Rosansky look on. 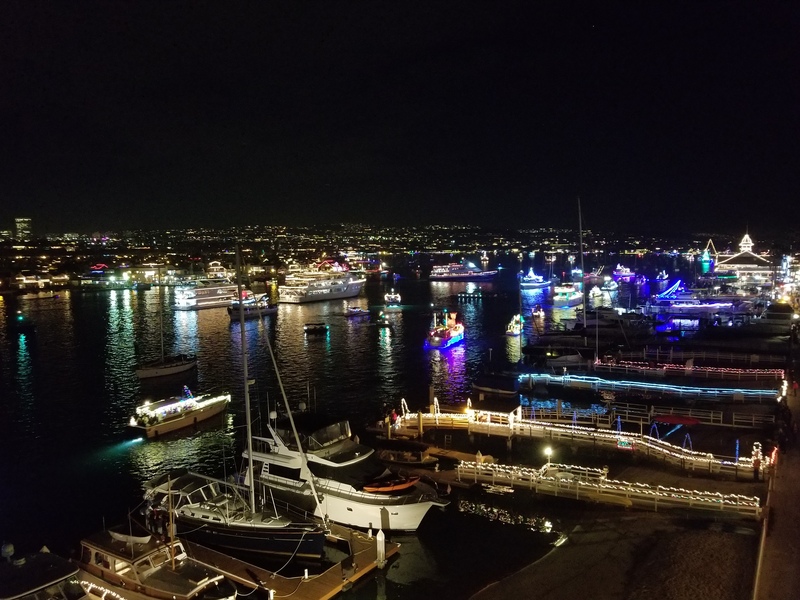 “This is an important event for Newport Beach, filled with holiday cheer and magical, artistic innovation, but it also drives more than $4 million of economic impact into our city. 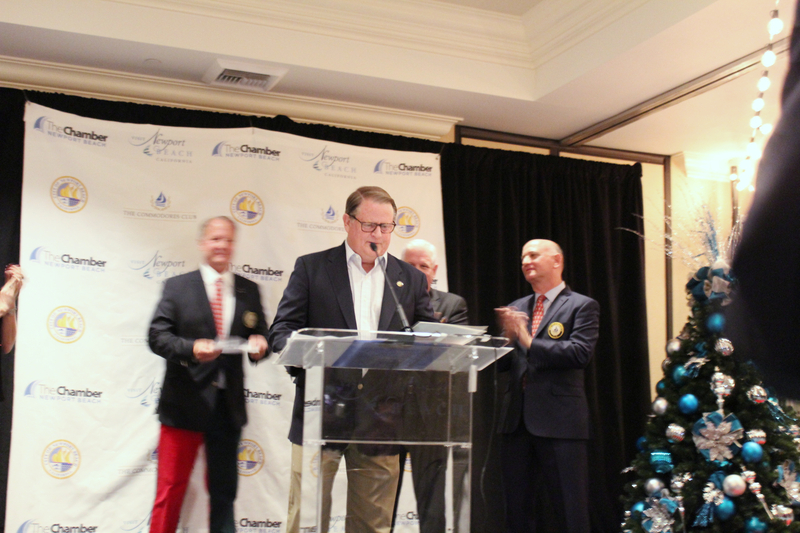 We are so proud to show the world the abundance of holiday spirit and generosity that exist here in Newport Beach,” Duffield said. In quintessential Duffy-form, he quipped that he was reading each word of a prepared speech because he was asked to by the organizers. In the future, he would just speak openly. As fireworks boomed and the parade sailed into the night, the feeling around town was cheerful and bright. At least for those not stuck in traffic. Chamber of Commerce Board Member and Council President of the Ambassadors Kay Walker and Colleen Pilz enjoyed the festivities on the patio of Balboa Bay Resort, along with Library Board of Trustees member Paul Watkins, his wife Rhonda, and dozens of other merrymakers. 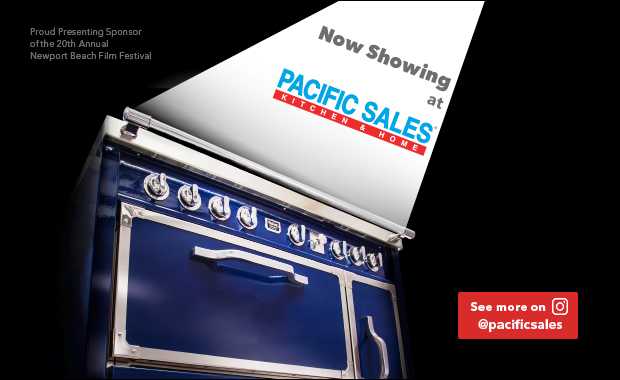 “This event is truly a crown jewel in Newport Beach,” Pilz added. Beek, whose grandfather helped make the boat parades a tradition as grand as the Tournament of Roses, summed up the feeling for those who have attended the boat parade year after year after year. 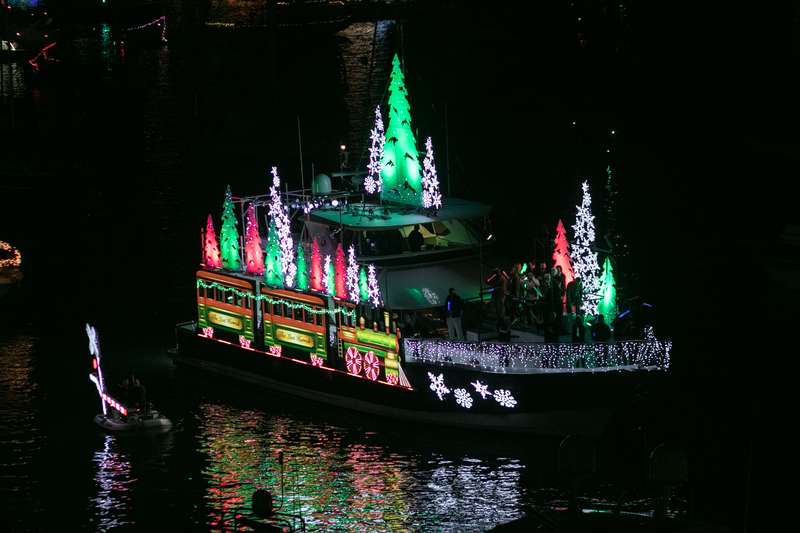 To read about where to dine and view the boat parade, click here. 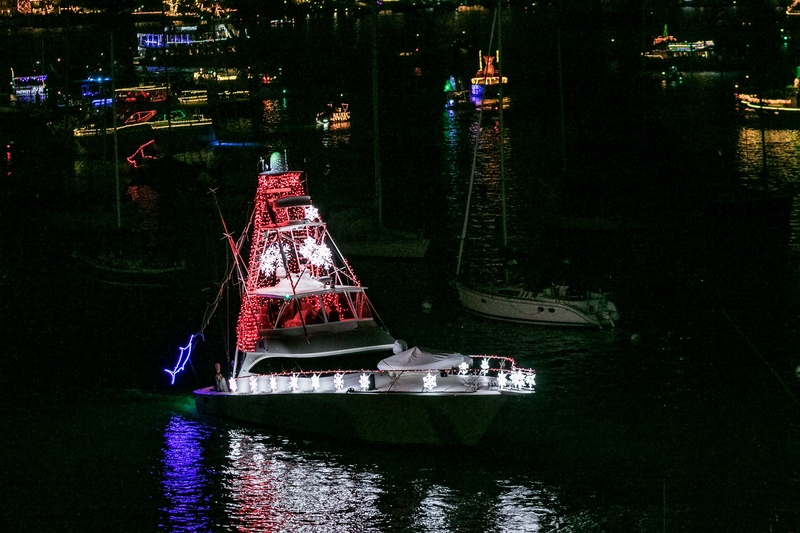 The 109th Newport Beach Christmas Boat Parade sails from 6:30 to 9 p.m. every night through Sunday. Sunday night fireworks will officially close the event at 6:15 p.m. at the Balboa Pier. The parade starts and ends at the tip of Lido Isle. 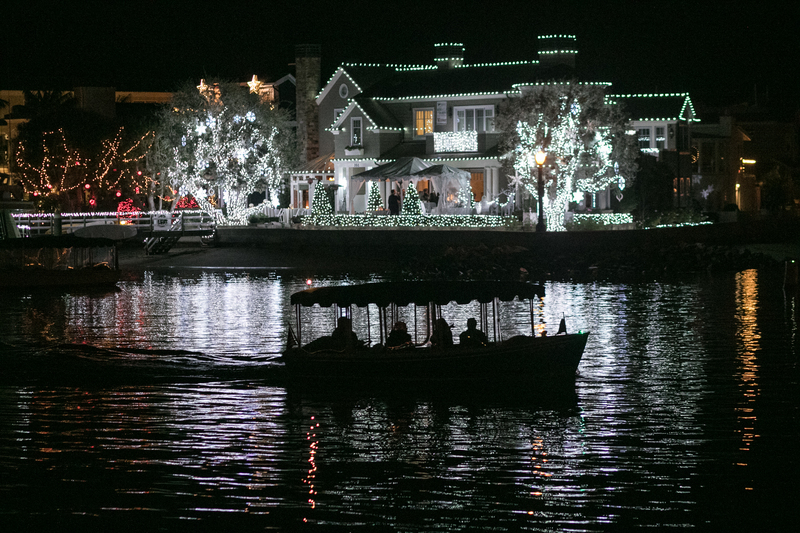 People float by in a small boat as they view decorated houses in the Ring of Lights Contest. 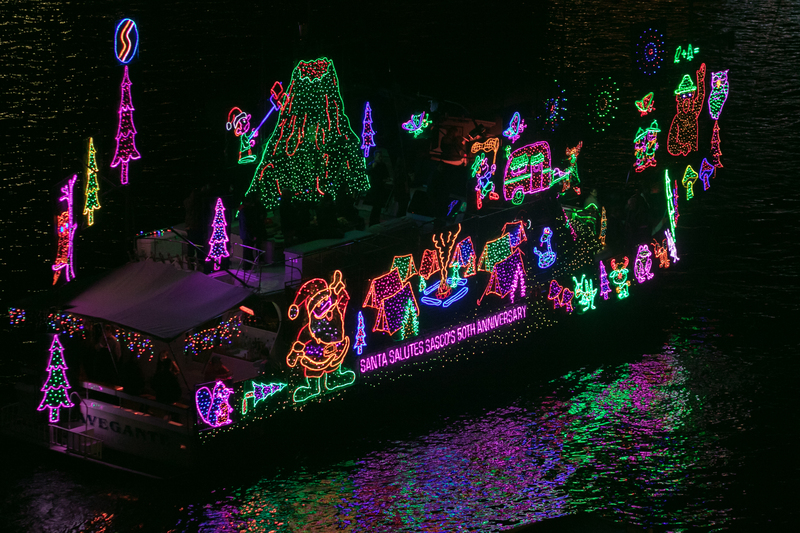 A bright and colorful boat on Wednesday, the opening night of the Christmas Boat Parade. A participating boat passes by the Balboa Pavilion. A small decorated boat in the first night of the parade. 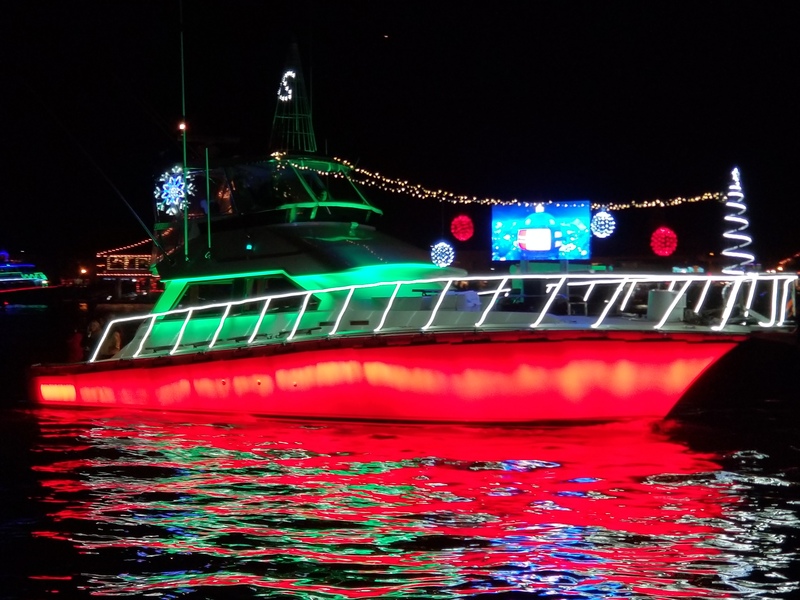 A participating boat in the 109th Newport Beach Christmas Boat Parade.